The Audi TT RS Coupé has never been this masculine. The completely redrawn front end and the striking rear end give it a dynamic appearance. The quattro logo in a matt titanium-look is positioned in the lower section of the gloss black grill with its matt black Singleframe. The lateral air inlets, which have been enlarged once again, are each divided by vertical strips on the inside and outside. For cooling purposes there are additional radiators located behind the typical RS honeycomb grill. The lateral air inlets that extend almost all the way to the front wheel wells make the new TT RS appear extremely wide. 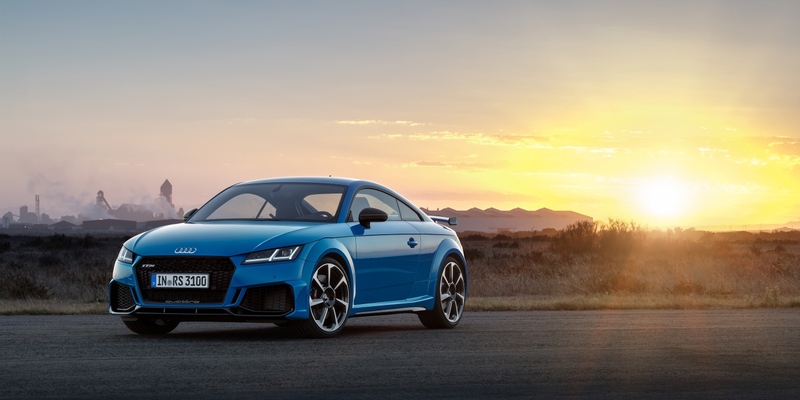 "The new TT RS is in absolute peak form," says Michael-Julius Renz, CEO of Audi Sport GmbH. "Like a well-trained athlete, it showcases even more prominently how much power lies beneath its muscular outer skin." Five-cylinder, 294 kW (400 metric horsepower) output, 480 Nm (354.0 lb-ft) of torque, quattro all-wheel drive - the Audi TT RS impresses with inner values and offers an outstanding driving performance. The Coupé sprints from 0 to 100 km/h (0 to 62.1 mph) in only 3.7 seconds. Musical accompaniment is provided by the typical five-cylinder sound: 1-2-4-5-3. Due to this ignition sequence, ignition alternates between adjacent cylinders and those far apart from one another. This unique rhythm is music to the ears of many horsepower purists. Last year, Audi Sport received the sought-after International Engine of the Year Award for the 2.5 TFSI engine for the ninth consecutive time. The turbo engine draws its power from an engine displacement of 2,480 cm3. The engine’s maximum torque of 480 Nm (354.0 lb-ft) is available between 1,950 and 5,850 rpm. The top speed is regulated at 250 km/h (155.3 mph) or an optional 280 km/h (174.0 mph).